It may appear that any attempt to provide a definitive assessment of Georgia's war with Russia on 8-12 August 2008 is premature, for the very good reason that the broader conflict of which this disastrous eruption was a part is itself far from over. A year on, political and military tensions continue to swirl around Georgia; parts of its territory remain occupied by Russian forces, its opposition forces sustain a near-permanent campaign to unseat President Mikheil Saakashvili, and its lost territories of South Ossetia and Abkhazia are further than ever from its grasp. In these circumstances, the potential for new events to become part of an unfolding story that requires constant updating is ever-present. A case in point is the forthcoming report by the European Union's Commission of Investigation into the true sequence of events around the conflagration in Tskhinvali on 7-8 August 2008 which sparked the war, due (after delays related to perceived time-sensitivity) to be published on 7 August 2009. This will be followed by demonstrations in the centre of Tbilisi (one anti-government, one anti-Russian), where the opportunity for serious clashes is evident. The story of the 2008 war, then, is one of unfinished business. Yet where Georgia is concerned, a fairly resilient profit-and-loss account may still be feasible; for the overall shape of what has resulted seems to be clear even if many details about the war itself are still to be established. In this light, the perspective of a year suggests that Georgia has experienced four clear losses. First, the loss of a fifth of Georgia's former territory to Russian-backed separatists now looks irretrievable. What population movement there was from what might be called "Georgia proper" (or "Georgian Georgia") to Abkhazia and South Ossetia is now down to a tiny trickle of pedestrians (and, in the case of South Ossetia, even that movement has in both directions been halted as the war's anniversary nears). The support for Georgia's territorial integrity from the United States and European Union has proved to be empty verbiage, and arguably have proved more damaging than a frank reassessment of the situation would have been. Abkhazia has reconciled itself to its revised constitutional and political status (de jure as a protected pariah, de facto as a part of the Russian Federation); it restricts its hostility to denying Georgian villagers' access to their hazelnut plantations, or to insisting that Georgian workers on the shared hydroelectric station on the Inguri river (which forms the border with Georgia) take out Russian citizenship. The educated elite that leads the Abkhaz government from the capital, Sukhumi, permits discussions between Abkhaz and Georgian intellectuals on the future of the territory and its relations with Georgia to take place; these are conducted under the auspices of the Berghof Research Centre, and in safely remote places where the issues between them have obvious relevance (such as Kosovo). South Ossetia's condition is rather different, reflecting the variations that (despite their being often lumped together) always existed between the two "breakaway" statelets. The South Ossetian government is much more a puppet-theatre of Russian thugs and ex-security men; the new prime minister is Vadim Brovstev, a construction magnate from Cheliabinsk, a figure who has as tenuous a connection to Ossetia as most of its previous rulers. The leadership in Tskhinvali maintains a spectacularly aggressive stance towards Tbilisi. It demands that Georgia cede to South Ossetia areas that were never in the region (such as the glacial Trus valley, which sixty-five Ossetian families regard as their ancestral home). There is little doubt that occasional mortar-fire from the Ossetian side of the border and continued ethnic cleansing of the Georgian villagers who remain will persist in the hope of provoking serious conflict. Second, Mikheil Saakashvili's political calculation that a combative stance towards Russia would earn him greater support from the United States has seriously backfired. If Georgia's president really thought (or worse, if his American advisers intimated) that provoking Russia would result in a conflict so bloody that the avowed Georgia-lover and Republican presidential candidate John McCain could use it as a launch-pad to the White House, his judgment is even more erratic than was always feared. The sight of Barack Obama's deputy, US vice-president Joe Biden limply shaking Saakashvili's hand during his visit on 22-23 July 2009 - almost as reluctant as Ayatollah Ali Khamenei awkward receipt of Mahmoud Ahmadinejad's kiss - spoke louder than any words of how far Georgia had receded from the forefront of American political thinking. More broadly, the sense that Georgia is a country of great strategic importance to Washington, not least as a transit-route for the west's energy supplies, has been overshadowed by larger considerations. The US needs Russia far more - for example, to overfly central Asia on the way to Afghanistan, and to help in the efforts to restrain Iran's nuclear programme. Third, Georgia's economy and infrastructure was hideously damaged by the August 2008 war. Russia's forces destroyed a substantial amount of Georgia's military equipment and physical capital (including bridges, buildings, and roads); they also displaced around 20,000 Georgians, who - in addition to the many thousands more forced into flight by the conflicts of the early 1990s - need to be rehoused and provided with the means of access to food and healthcare. The replacement and repair work is ongoing, but what is less straightforwardly healed is the shattered confidence of foreign investors and of international and local business. This, after all, is already a period of economic difficulty, which only accentuates the problems of the nearly 40% of Georgia's population that live in poverty (including the estimated 30% who are undernourished). In this respect, two sets of figures are genuinely alarming. First, in January-June 2009 only 600,000 tourists visited Georgia, compared to 1.3 million for the same period in 2008 (it is worth noting that Tbilisi classifies all foreign visitors, the American colonel and the Turkish minibar-salesman alike, as tourists). For a country with population of 4 million, the loss of so many visitors represents a major source of income. Second, the planned railway between Tbilisi and the Turkish eastern border-town of Kars - announced with fanfare in 2005, and with a scheduled opening-date of 2010 - no longer reports its progress. The Turks are languidly building their own 80 kilometres to the Georgian frontier and the city of Akhalkalaki, while the Georgians are talking about modernising their narrow-gauge line onwards to Tbilisi. But as of 30 July 2009, the railway's financial backers - Azeri, reflecting the fact that the line's construction was meant to benefit Baku even more than Tbilisi - had paid out only $25 million of the promised (and required) $200-million loan. The attraction of embarking at London's Kings Cross and alighting days later in Tbilisi (itself dependent on the completion of the Bosphorus tunnel) may always have belonged more to touristic fantasy than humdrum reality (especially given the state of the Ankara-Kars line and arduous Georgian border-procedures that include gauge-transfers) was probably always overstated. But the railway, like the Baku-Tbilisi- Ceyhan (BTC) pipeline, had a symbolic importance far greater than its economic potential. The indicators of its stalling are significant indeed. Fourth, the deterioration in Georgia's public and political life has accelerated to cast further doubt over its prospects of democratic progress. Mikheil Saakashvili's once-charmed political reputation had already been greatly tarnished by the closure of an independent TV station and then (in November 2007) the brutal suppression of opposition demonstrators; but it has suffered even more from the combined recklessness and callousness of his conduct of the August 2008 war. The legacy of the calamitous assault on Tskhinvali - which involved shelling a city inhabited by civilians, while failing to block the Roki tunnel (the only access-route available for the enemy's intended counter-invasion), the flood of blatant misinformation poured over foreign politicians and journalists, all justified by Saakashvili's near-hysterical public appearances - has been the alienation of the president's political allies as well as much of the Georgian electorate. The results are everywhere, and in some cases alarming. The former parliamentary speaker Nino Burdzhanadze, the third of the "rose revolution" triumvirate (along with the mysteriously deceased Zurab Zhvania and Saakashvili himself), now seeks directly to replace the president, using street-protests as a vehicle. More disturbing are some of the candidates for the presidency who have emerged: among them Alexander Ebralidze (a godfather of St Petersburg's mafia) and Giorgi Targamadze (the pro-Russian Christian Democrat leader and former aide to Aslan Abashidze, one-time boss of Georgia's southwest Adzharia region). The most reputable figure in Georgian public life is Sozar Subari, the country's ombudsman and public defender; Subari is also a former journalist and deacon of the Orthodox church, who was beaten up by Saakashvili's thugs in 2007). Now he is to relinquish his post on 16 September 2009, which is to be filled to by the yes-man Giorgi Tughushi. This is just the most worrying example of the dizzying cabinet merry-go-round in Tbilisi, where ministers are sacked and hired with abandon and in a way that can only reinforce the erratic and counterproductive nature of the Georgian government's policy-making. The examples are legion. The abrupt decision of the economics ministry to raise (and by a vast amount) the transit-charges for shipped containers - one of Georgia's main sources of income - added to unconscionable port charges that make Poti three times as expensive as Shanghai to use; the result was a strike by international heavy-goods haulers that lasted a week. This, like other parts of the Mikheil Saakashvili circus-act - confessing his disastrous miscalculations to the Wall Street Journal then denying his words, dispatching his foreign ministers with ludicrous abandon - makes clear to the world that Georgia no longer has any consistent or calm voice. It may seem absurd to say that Georgia achieved anything from what was so clearly a military debacle. It is possible, however, to make the case that Tbilisi has accrued four benefits from the war of August 2008. First, the very clarity of defeat means that Georgia can in principle - rather like an amputee who has lost a beautiful but gangrenous pair of legs - now concentrate on the process of national rehabilitation. If the pain of removal is yet to become fully accepted, at least it can be said that the endless, dangerous and febrile rhetoric about recovering lost territory has died down. Indeed, to a limited extent a lesson seems to have been learned. Another fractious minority, the around 250,000 Armenians who live (mostly in poverty) in the southeast Javakheti region no longer have to endure arbitrary arrest or beatings for asserting their rights and views. Georgia's often embittered relations with Armenia (in which the Tbilisi-Kars railway project, designed to bypass Armenian territory, was another irritant) have considerably improved. In addition, the very presence of heavily armed Russian troops on Georgia's northern borders - enough indeed to overwhelm and paralyse the country within hours - has provoked Tbilisi to launch a flurry of strategic projects that could be of longer-term benefit. These include the opening of a new airport at Batumi, used also to serve by Turkish citizens travelling to or from Hopa and Rize; the building of a new east-west line of communication further to Georgia's south, rehabilitating the currently dreadful route connecting Bolnisi to Akhalkalaki and Batumi; and the plan to make Kutaisi, the true centre of Georgia, into a joint capital city (including a relocation of the national parliament there). Such initiatives, if guided by a genuine decentralising purpose, will revive the provinces and their agricultural production; if they are combined with a championing of good ethnic relationships (in conditions where, for instance, tens of thousands of Ossetians live in harmony with Georgians in towns and villages all round Tbilisi), the result could be a genuine restoration of civic life. Second, Georgia loss in the war of August 2008 does not translate into a Russian victory. Moscow's declared aim of regime-change in Tbilisi achieved the opposite: it saved Mikheil Saakashvili from what would otherwise have been his humiliating rejection by an angry populace. At most, Russia managed to steal the title-deeds to territory it had already in effect appropriated. The war vaporised any illusions that Russia was moving in a democratic or Europe-oriented direction. The brutality of Ossetian irregulars and Ramzan Kadyrov's Chechen contingents exceeded the war-crimes committed by Georgian forces in Tskhinvali. The Georgians as a result were awarded the sympathy due to victims; and though denied any support whatsoever in pursuit of the reclamation of Abkhazia and South Ossetia, they have been supplied with much of the necessary finance and materials for reconstruction. These are being applied with some vigour, in financial conditions where the Georgian lari has held up well against the dollar and inflation is minimal. Third, a certain space of political and civic freedom has opened in Georgia's public life. There have been fewer extra-judicial detentions and assaults on opponents. Georgia's journalists are bolder. Even in 2007 they dared to screen a film to 3,000 people in Tbilisi's Vake park which proved that Zurab Zhvania's death (allegedly through a faulty gas-heater) must have been murder; now such subjects can be aired in print. There have even in the wake of the August 2008 war been apparent improvements in Mikheil Saakashvili's notorious (if under-reported) behaviour. There are no recent photos or accounts of harassment on a scale that even Silvio Berlusconi might have shunned; his official car no longer brakes at the sight of a pretty young woman so that he can get out and invite her to join the presidential secretariat (in scenes reminiscent of Lavrenti Beria's odious example). Nato cannot come to liberate ..."
In 2009, Barack Obama's offer to press the "reset" button with Russia has been rightly understood in Georgia as representing the same type of strategic calculation and true guide to their situation. The realities are unavoidable. Most of the European leaders who expressed fervent support for Georgia expressed during and soon after the war have gone quiet. The strategic context (including Europe's gas-supply requirements) is plainer than it once seemed; Britain's Conservative leader David Cameron, for example, no longer declares that Russian shoppers cannot anymore expect to go on "marching into" London's up-market Selfridges store. Georgia can no longer expect its notional ideological allies to be prepared to sacrifice litres of blood or billions of dollars: Realpolitik prevails. The experience and advice of the other "limitrophe" states (i.e. those bordering on Russia such as Estonia and Latvia), which have learned to oppose Russian aggression with cool cunning, are now being absorbed in Georgia. A number of opinion-polls suggest that most Georgians no longer support the country's search for Nato membership. They are, moreover, increasingly disenchanted with politicians' slogans and rhetoric. The most visible sign of the opposition's protest-wave - the elaborate structures of reinforcing steel bought by Nino Burdzhanadze and welded by her supporters into rows of "cells" along Rustaveli Avenue, implying that Georgia was a police-state - have now been dismantled; the crowds that threatened to force the president's resignation have dispersed. The compensatory gain may be a growing political maturity. The only problem is the lack of new political talent in Georgia - the much-heralded emergence of former United Nations ambassador Irakli Alasania - to assume the mantle. What does this profit-and-loss account of the August 2008 war suggest about Georgia's likely future direction? The hardline stance of Dmitry Medvedev and Vladimir Putin towards Georgia contributes to the tense overall situation in the region on the war's anniversary; but on Georgia's own part there is no expectation that Georgia will undertake or invite renewed aggression. The logic of Tbilisi's current course is to move towards economic self-sufficiency. The current trading conditions render the "silk-road"-style ambition of turning Georgia into a great crossroads of international trade less plausible than homegrown solutions: for example, using Georgian brainpower and education to revivify its industries and national services. In political terms, Georgia must now be seen to meet minimal European standards, even if European Union accession is now almost as unlikely as Nato membership. That will mean reforming the judicial system, which still bears a worrying resemblance to that of Putin's Russia (judges may no longer take bribes, but they still take instructions from government ministers). The question of leadership is ever-present. My guess is that Mikheil Saakashvili will hold on to power, for at least three reasons. First, he cannot afford to lose it: he would need an impossibly wide guarantee of immunity against prosecution for so many suspected crimes, including the violent removal of opponents and colleagues. Second, he remains - for all his serious faults - the most intelligent, energetic and adaptable figure in Georgian politics. He is not (in contrast to most of his rivals) a member of the communist-nomenklatura-turned-monopolist-élite who thrived under Eduard Shevardnadze's régime, and can communicate fluently with Europe's politicians (even if he has long ceased to enchant them). He has also major domestic achievements to his credit: for example, creating the unlikely outcome (where the Caucasus is concerned) of a customs-service and police-force that do not extort cash-bribes, and a higher-education system in which entry to university and appointments are based on standard qualifications and merit. Third, and above all, every rival - with the possible exception of the outgoing ombudsman, Sozar Subari - has serious drawbacks. Salomé Zurabishvili, however intelligent and reasonable, was born in France; Irakli Alasania, an internationally respected diplomat, cannot take the heat (voted by the readers of one newspaper as Georgia's "most constructive politician", he is literally sickened by the abuse any politician must expect and by the character of those he must ally himself with); Nino Burdzhanadze may model herself on Margaret Thatcher and dress well enough to feature in Vogue, but has never said or done in her entire career a single thing of note (and is compromised by family connections to the old Komsomol and by enormous, unaccountable wealth). Joe Biden on his visit to Tbilisi met a selection of four possible presidential candidates: Giorgi Targamadze, Nino Burdzhanadze, Irakli Alasania and the businessman Levan Gachechiladze. It is a reasonably sure guess that after doing so the United States vice-president will have concluded that the Americans should stay with the devil they know. A single outstanding issue - and the original casus belli - could yet upset all calculations: the fate of the territories, Abkhazia and South Ossetia. A realistic stance and policy by Tbilisi here is even more desirable than presidential continuity. 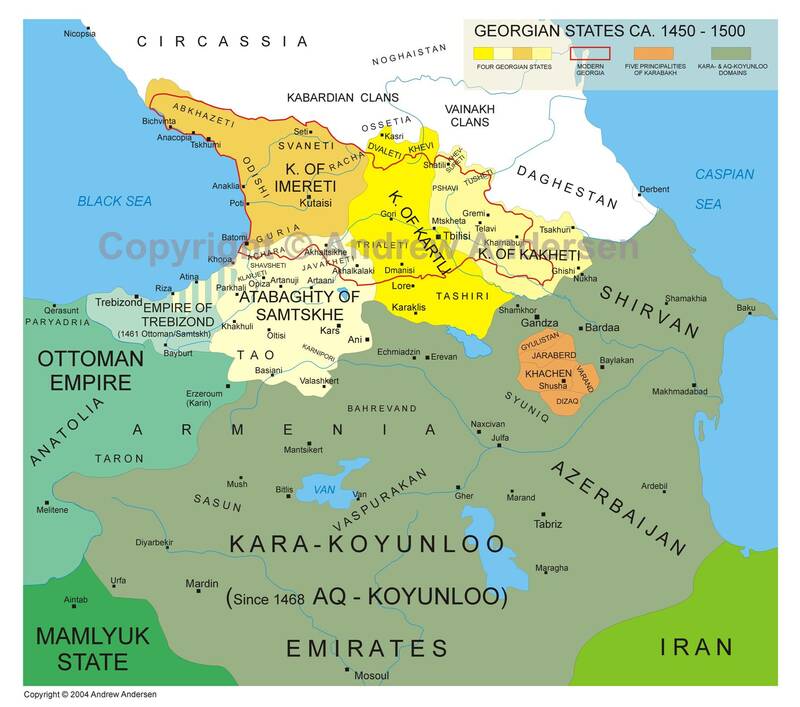 Since Eduard Kokoity's South Ossetia has no resemblance to or potential to become a viable state - which Abkhazia has - what happens in relation to Sukhumi is vital (see Neal Ascherson, "A Chance to Join the World", London Review of Books, 4 December 2008). Here, then, is a proposal. If the European Union and the United States could boldly offer Abkhazia recognition of its independence, but with the demand that it be free of Russian forces and the guarantee that Georgia would not be allowed to attack and an offer of direct connections by sea to Turkey and by air to Europe - then Georgia's initially furious reaction should eventually change to acceptance. For Georgians would come to see that a genuinely independent Abkhazia - which many Abkhaz want, but which Russia will almost certainly not permit - would be a far better neighbour to them than an Abkhazia which is just another region of Russia's destabilised Caucasus.